Actually you also don't see a trail in front of the fighter. Depending on atmospheric conditions and the missile used, you may not see a smoke trail beyond the immediate vicinity of the missile anyway. Smokeless AAM's are available on the market. India has them for their Flanker fleet. teach wrote: It's a 767. I'll tell you even more: it's the 767 prototype, in Boeing colours. I've seen that animation before I made my first post but I didn't get fooled. So tell me, whom was the animation made by? A Group of self-declared debunkers who would go all the way to show that this is fake? It's not because it has a B767 paint job that it's a B767! Ever heard of "the eye sees what it wants to see"? Here's an exercise for you. Try to discern which one's the B767 and which one's the B777. You will immediately learn to see everything that's wrong with the animation you provided. Look at the wingspan. That's definitely a B777 wing there. Also look at the cockpit windows. The B777 has this typical cockpit window structure that hides its windows if seen from above. The left inboard aileron was drawn to give it the shape of the B767 aileron. On the original image it's not that clear. As for the white markings on the wing extrado's root. Well it's really drawn, because it could just have been the reflection of the sun situated South-West at the time. It doesn't take much to fool people. If this was real evidence, the reactions we see would exactly be what we see now. Wrong assumptions over wrong assumptions. I'm not saying that it's real yet; it does however look possible. And sorry, I still don't see the cloud. Please make the effort to put it in a visible way instead of saying it's Southeast of the runway. I just don't see it. Even if it's there, who's to say that it wasn't planted on the 2012 version of the Google maps? After all, this debunking is being organised by intelligence agencies, and they have access to whatever they want from any U.S. company. Good to see you at least admitting it's not a Malaysia paintjob. We could stop the discussion right there, because that alone proves the picture is false. But this is too much fun. Oh, and it's a 767. It was pretty much the first thing I saw when looking at that picture, well before I had seen the article on bellingcat. The cockpit windows of the 777 are 100% identical to those of the 767. That's because the nose (known as section 41) of the 767 was simply copied onto the 777. Feel free to look that up. Oh, and in that 'exercise' it's very easy for anyone with a passing knowledge of commercial aircraft to see that pictures were switched. You know what gives it way the most easily? The taper of the nose right behind the cockpit windows / section 41. On the 777 it continues for a bit, to accommodate the noticeably wider fuselage, while on the 767 it stops much sooner. This is also evident on the Russian spoof picture you're trying to defend. That's a 767, no doubt in my mind. Yes, you're living proof of that. ...because you're literally the only one not seeing that cloud. Oh God, tin foil hat territory? Really? Do you have any idea just how much of a fool you're making yourself out to be by trying to pass this picture off as real? It's pretty clear you're doing this because you have an agenda to push, but at least pick fights you can win. Nice attempt to put words in my mouth. It's the same section 41 until just beyond the side-windows. From there it looks totally differently, which is why it looks as though the windows are hidden when you look from atop at an angle on the B777. On the B767, it looks like a dolphin-nose, exposing the windows' structure more. You are dreaming that taper. There is no such thing visible on the Russian pictures. And I can guarantee you I have more commercial aircraft knowledge than you can ever dream to have. I think that you are fooled if you think that Russia would ridiculise themselves by putting a fake satellite image. That's not what they do. Flanker2 wrote: Nice attempt to put words in my mouth. I'm not. You didn't even argue with the idea that the plane has Boeing colors. That should pretty much end the discussion right there. Good for you! It's a 767. You've pretty much just confirmed it yourself. So where is it? Which cloud are you refering to? And yet, that's exactly what happened. More than likely, the Russian TV station that broadcast this got fooled by a hoaxer, and didn't bother to check the picture thoroughly in their enthusiasm to get the 'smoking gun', because they too would've seen it's a fake. You know what's funny? On other boards, even the staunchest Russia-supporters aren't touching this one with a ten foot pole because they realise it's a fake. The Russians themselves aren't even mentioning this anywhere. Kind of strange, because if true this would be front-page news all around the world, and absolute solid proof that the plane was not shot down by the rebels. It'd be the biggest smoking gun since the term was invented. Caught red-handed, with a photo as proof. ...and yet, the Russians remain silent. You want to know why? Because they also see the picture's a fake. You're pretty much the only one who still doesn't. teach wrote: The Russians themselves aren't even mentioning this anywhere. Kind of strange, because if true this would be front-page news all around the world, and absolute solid proof that the plane was not shot down by the rebels. It'd be the biggest smoking gun since the term was invented. Caught red-handed, with a photo as proof. It might not be front-page news, but for sure it's all around the world...as one of the largest recent Russian fails. No seriously, I don't know what Flanker tries to prove, but the way he describes the difference between the 767 and 777, he actually says himself its a 767 because you can see the cockpit windows in exactly the same ways as on that top view of the 767 prototype, with the only difference that the picture is made less clear. But from that angle both the 777 and 767 windows are visible anyway, but if he tries to prove that way that it's indeed a 767 (yes he tries to prove it's a 777, but he fails...hard), that's his problem. But the cockpit windows are probably the worst example of how to prove if these satellite images are real or not. There are much more obvious elements that show it's a huge, big, embarrassing fail. Something they also realise in Russia as Teach said (problem is noone realised before spreading it). KIEV, Ukraine — The man whose email was used as proof that Ukraine shot down MH17 told BuzzFeed News that he had found the image on a forum and was upset that it had been used so widely on Russian TV. George Bilt—who said he is an MIT graduate and aviation expert with 26 years experience, but would not provide further biographical details—said that he had come across an earlier report by the Russian Union of Engineers (RUE) blaming a Ukrainian fighter jet for the crash, and thought that it concurred with his own amateur findings. When he saw the picture online, Bilt wrote to Andreyevsky, the “expert” from the broadcast, with a link to the forum where the image was posted, clearly stating that he had found it there. Bilt said that he was shocked to see his email, which he thought that he had written to Andreyevsky in confidence, used on Russian TV as proof of the Kremlin’s claims, citing him as a source. “I am quite unhappy that my bona fide informal attempt possibly became a source of yet another battle in a media war,” he said. “This was definitely not my intention. I am also not looking for a cheap fame. This tragedy is simply too awful to gain from it. “I am sorry for all those people I might have indirectly and unintentionally misled or disappointed by this unexpected mess in anyway,” Bilt added. “Personally and professionally, I will not continue with this amateurish investigation effort due to the rather insane highly confrontational situation prone to escalation and with the elements of media war. “Those folks are either desperate or totally unprofessional,” he said. Oh, and in case you still haven't 'found' the infamous cloud, it's been put in a nice red square for you in one of the facebook screens in that link. Flanker, How much is it for a post? Flanker2 wrote: Please check my attached analysis. I correct my previous calculation with a detailed, but simple calculation. The perceived size of the aircraft is only one of the many factors. If you have a satellite at a 1100km orbit that zooms in 100 times, an aircraft at 11km will appear at its live size. Flanker's "simplistic calculations" seem flawed. Using Flanker's figures and even more simplistic calculations, using nothing more than similar triangles, we arrive at the equation x/2700 = (x-11000)/64 for the height x of the satellite's orbit, showing that this curious satellite would have flown just a few hundred meters above the B777. (Zooming and lens geometry are irrelevant for this computation). Flanker must be right simply because russian First Channel presented the same 'evidence'... I understand ru authorities target domestic population that does not have access to alternative info channels, but would you, flanker, think this work on people with critical minds? Since there are so many people claiming that it's a B762 (or any type of B767) thanks to their oh-so good aviation knowledge blablabla, I've made a comprehensible measurement so that even a monkey can see that it's a B772. On the B762, the real proportions are 47.6(wingspan)/48.5(length)=0.9814 or 98.14%. This is what the wingspan needs to look like for the B762, for the measured length. It's a small difference but the difference between a B762 and a B772. As for the rumored Russian picture of the B767 house colors top view, it looks like it was on a Russian website hosting pictures, where it doesn't belong and what's the purpose of picturing an image of a B767 from that angle? And why exactly in Boeing house colors, so everybody can recognise it? If you ask me, the fabricated image is the one of the B762 in house colors and it was planted by intelligence operatives to discredit this evidence. IF you think that they wouldn't do that, you have no idea how they operate. And obviously Mooney is here again, since this seems to be the only topic he monitors. He's probably one of Langley's low-level aviation blog monitor. You couldn't choose a more typical American GA nut-name. As for the titles on the picture, given the sun's position at the time and the glare on the wing root, if you look closely you can see that the titles start more to the left but are probably glared out. So which one is the fake now? Flanker2, never been to America, but I'm fluent in Russian language, born in Soviet Union. Flanker, the ideas you push forward are yours or you 'borrow' them from somewhere? Why is this 'somewhere' resemble so much the trusted sources of RU 'free media'? Flanker2 wrote: Since there are so many people claiming that it's a B762 (or any type of B767) thanks to their oh-so good aviation knowledge blablabla, I've made a comprehensible measurement so that even a monkey can see that it's a B772. It's a 767. You realise that in the original picture, part of one wing is cut off, and that the picture wasn't taken exactly from the top, meaning your 'brilliant' calculations aren't really uselful, right? Of course you do. That alone is more than enough to make up for the tiny discrepancy. Oh brother, tinfoil hat territory again . How exactly do you still expect to be taken seriously? The titles are in exactly the same place in all those pictures. And you can see that too. You've just decided to not accept it, as it doesn't fit your agenda. Part of me wants to put you on the ignore list, just so I don't have to read the deluded tripe you write anymore, but at the same time it's terribly fun to watch the train wrecks you post here on a regular basis. I will not intervene myself in that discussion, but I would like to relay the opinion of the aviation specialist of the Wall Street Journal: "This is a 767-200, not a 777 as Russia says. Horizontal stabilizer is too big". The only source for this weekend rumour is one item on Russia’s 1TV. Apparently a journo there received a “satellite photo” from a source he thaught was reliable. It wasn’t. The photoshopped photo and the story behind it have not been produced as truth by the Russian government (Kremlin.ru). Russia Today, focussing on media coverage about Russias in the west, doesn’t seems to have copied it either. Therefore, it’s just what it is: an untrue story. Could be voluntary misleading, could be an unvoluntary error. We'll never know, unless the journo from 1tv.ru gives his source. But then - the Nato and the European Union have spread so many lies in the past months about MH17 that this story is negligible. Are stories from Belgium's 100% state networks VRT and/or RTBf “official news from Belgium"? If not, let's no do that for Russian state networks either please. You mean Jon Ostrower? He's not a specialist of anything. He's just an aviation blogger promoted to journalist, because he had an inside guy at Boeing reporting to him about the B787. If you've seen any of his video reportings, you would quickly realise he's a blogger, not a journalist. I though I'd make that clear. If the B767 house colors pic wasn't taken from the Russian pictures website, where was it taken from? What's the original source? I've never seen any material showing a picture of an aircraft at that angle. It just doesn't make sense. The B and O on the original B762 photo's of NASA actually overlap the wing. Everyone can see it. The B767 rendering is thus a bad reproduction of that image. The B767's horizontal stabilisers aren't bigger than the B777's tailplane by the way. It's much smaller. It's only bigger on that fake rendering of the B767. It's actually a good idea. I'll make a comparative Gimp measurement of the span of the h. stabilisers on the picture and post the result here. Last edited by Flanker2 on 17 Nov 2014, 18:41, edited 1 time in total. sn26567 wrote: I will not intervene myself in that discussion, but I would like to relay the opinion of the aviation specialist of the Wall Street Journal: "This is a 767-200, not a 777 as Russia says. Horizontal stabilizer is too big". That is indeed another dead giveaway. While the wing and general proportions of the 762 and 772 are similar to the untrained eye, the vertical stabilizer on the 767 looks clearly different from that on the 777, with a root chord that is proportionately larger than the tip chord on the 767 compared to the 777. This picture has the distinctive 767 stabilizer. But Flanker2 will find a way around that, no doubt. Flanker2 wrote: If the B767 house colors pic wasn't taken from the Russian pictures website, where was it taken from? What's the original source? How on earth is that even important? 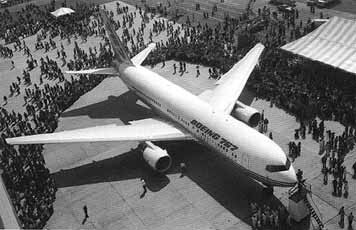 There are literally dozens of pictures of the 767 prototype on the net that are not on Boeing's site, including promotional ones. Are you seriously suggesting they were all planted by the CIA? As they do in the promotional Boeing pic. They're in the exact same spot. Make sure you measure both the root and tip chord of both too. Because that's where the main difference lies. Have fun! On Nov 23rd 2014 the DSB announced, that a recovery operation to retrieve (most of) the wreckage has been completed, 12 rail cars with wreckage of MH-17 are on their way to Kharkiv, from where the further transport to the Netherlands is being organized. A few parts of wreckage, too large to be transported by railway, have been trucked to Kharkiv. The DSB added: "Although this recovery operation has ended, there is still wreckage left at the crashsite. Mostly smaller pieces of wreckage with no value for the investigation. Local services will remove those pieces of wreckage from the crashsite, as the recoveryteam agreed upon." sn26567 wrote: On Nov 23rd 2014 the DSB announced, that a recovery operation to retrieve (most of) the wreckage has been completed, 12 rail cars with wreckage of MH-17 are on their way to Kharkiv, from where the further transport to the Netherlands is being organized. Malaysia has expressed concern over the actually “unilateral action” taken by the Netherlands whose officials have announced the completion of the collection of the fragments of the Boeing plane (Flight MH17) that crashed in Ukraine. Malaysian representatives insisted on their mandatory participation in the work at the crash site, including the study and removal of the airliner wreckage and now it is unknown in which condition they will take to the expert examination. Also, Malaysia has still not been given an opportunity to participate in the criminal investigation, contrary to the promise given by Dutch Prime Minister Mark Rutte in Kuala Lumpur on November 5. Malaysia believes that due to its neutral position on the conclusions concerning the causes of the catastrophe, as well as owing to the fact that it put forward no accusations, a number of countries participating in the investigation are doing everything possible not to admit Malaysian representatives to the full-fledged investigation.